Formula One is an acquired taste. It takes a while to learn its complexities and a lifetime to understand how things developed to become the beast we know today. As a result, F1-watchers divide into two main camps with several subdivisions within those groupings. Understanding this, too, is a part of the enjoyment of the sport. We can define one main group as the enthusiasts (some might even say the afficianados); these are the ones who have been watching for years, done their homework, studied their history, and can now pontificate at great length on the most obscure details of the sport. Some specialize in statistics and can tell you who placed where in what race and in what version of that year's car. Others get secret enjoyment from scrutinizing the politics of the game and are ever ready to criticize the latest decisions of the FIA (yeah, I know I'm guilty of this one). Still others know the intricate technical details of how the cars work and find their entertainment in working out just why team A has stuck some weird protrusion on the car this season. But all in this group love F1 with a passion, regard it as the highest form of endeavor to be meddled with at your peril. They are the true grassroots that ensure F1's survival. The rise of television has expanded the other main group until it outnumbers the enthusiasts. These are the casual viewers who may have chanced upon a telecast of a race that entertained and so they come back for more - we could call them the fans. They are not about to build their entire calendar around the races but they will watch if they get the chance. Some will become interested enough that they start to learn and begin to recognize drivers and cars from lower down the order; ultimately, they may be transformed into enthusiasts. But most are there for the sheer spectacle and to cheer on any countryman of theirs - as demonstrated by the fall in Germany's viewing figures now that Michael Schumacher has retired. Television has been a double-edged sword for the sport. It has increased its popularity beyond recognition but also dictated changes that have weakened F1 as a sport, turning it into something that resembles a business more than anything else. 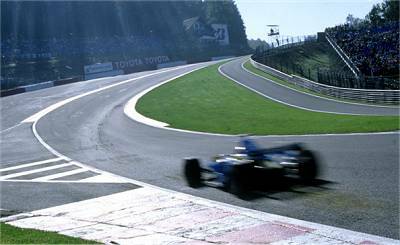 The need to keep the casual viewer and to continue to expand the audience has resulted in time-honored races disappearing and others appearing in some pretty unlikely places, rule changes intended only to affect the viewing experience have substituted for conventions that are as old as GP racing itself, and there are suspicions that the governing body meddles sometimes to keep the fight for a championship alive. It is quite clear that the FIA see a growing TV audience as necessary for F1 to survive in future. Increasingly, the enthusiasts' views are disregarded in favor of anything that will "increase the spectacle". The irony is that the more the sport is warped by rule changes, the less spectacular it becomes, until we have a situation where both groups of F1-watchers are crying out for more overtaking in races. Everyone knows what is needed to make passing easier but it seems that no-one is prepared to do it. The lesson ought to be clear but is rarely mentioned: you cannot design a sport for television and expect it to be watchable - the sport must go its own way and television allowed to find a way to make it watchable. When television first arrived in force back in the late seventies, F1 was going its own merry way, with rule changes so rare that there were years between each one. And the spectacle was such that a TV audience grew at a phenomenal rate, soon to outnumber those who actually attended races. With the arrival of Bernie Ecclestone as an appointee of the FIA, the money-making potential of this new audience was realized; suddenly the sale of television rights became big business and the imperative to keep increasing the earning power of the sport became all that mattered. We see the results today with F1 so constricted by its own rules that a proposal to standardize the cars can be made seriously by its president. It is not the way to go. Unless F1 returns to its roots by concentrating upon what is good for the sport rather than how to maximize profits, it will be changed so utterly that both fans and enthusiasts will desert in thousands. It is happening already with declining viewing figures and complaints at the dreary predictability of the races. The money men will destroy the goose that laid the golden egg. My fear is that they don't care. And why should they as long as they can fill their pockets at the expense of a sport that is now seen as a business? Tomorrow they can retire as rich men with never a thought for the shambles they leave behind them. Somehow the fans and the enthusiasts need to unite to wrest control of F1 from the grasp of the greedy and place it back with those who just want to go racing. Yeah, I know - fat chance. F1 needs a return to a basic formula. Look at MotoGP - there the rules are relatively straight forward and it's still every bit as fascinating technically as F1 without the artificiality of F1's weird rules. Strip it back down to x amount of teams striving to build the fastest machine within basic constraints and all the spectacle returns. I agree totally, Mad. Too much complexity just leads to bickering over details.